Originally introduced with the Galaxy S8, Samsung’s DeX feature has always been something of a curiosity. But in fairness, as admitted in the review of the original DeX dock we ran this time last year, that's always been part of the appeal. As an idea, there's a lot I dig about convergence - and I'm always up to see how companies attempt to tap into and execute upon the things that are compelling about it. Over a year has passed since that review and Samsung have continued to build on the DeX - so it seemed appropriate to revisit the feature and see how it has evolved and improved. The plan was simple: for one full working week, I'd rely as much as possible on the Samsung Galaxy Note 9 and the DeX for as much of my work as possible. The idea here was to put the Samsung’s bold claims around the feature to test. Is the Samsung’s DeX really any closer to achieving its goal of offering users the ability to realise the one-device-to-rule-them-all dream of mobile convergence than it was a year ago? Is this the future of computing or another dead-end like HP’s Elite X3? Up-front, there are a few caveats to my experiment. I did occasionally have to go back to my Windows-based workstation for a few bits and pieces over the course of the week. Sometimes I’d need a specific file, sometimes I’d need to use a Windows-only application - so I didn’t rely on the DeX 100%. Just as much as possible. The other caveat here is that while the Galaxy Note 9 now support DeX mode via a USB Type-C-to-HDMI cable, the limited usability of that setup proved more trouble than it was worth. While I have no shortage of keyboards around the office, most of the wireless options were Logitech products - which require the company’s proprietary wireless USB connector to connect and use. Opting for the HDMI-cable option meant giving up any USB functionality, which meant being unable to use any of these keyboards and mice. So we opted to use last year’s DeX dock instead, since it offered up a more-straightforward setup. As such, this article shouldn’t necessarily be considered a be-all-end-all, comprehensive write-up of the modern DeX experience. That said, I came away with more than enough experiences messing with the DeX to have a steadfast opinion on whether Samsung’s software has gotten much closer to realising its goal of condensing your smartphone into the one device to rule them all. And the painful but short version is that the DeX is still largely a fraught way to go. If you’re in the position where your workflow can be handled entirely by Android apps and you're looking to simplify your workflow into a single, always-connected device, the Samsung DeX does *technically* allow you do exactly that. Unfortunately, there are so many caveats and shortcomings involved that it’s still a very difficult proposition to recommend outright. Up front: it’s not all bad. Based on the bold assumption that your daily workflow can actually be handled entirely using Android apps, there’s a definitely a utility and charm to having your workspace contained within a single device. If you were running a business, the potential cost-savings are also pretty easy to see. 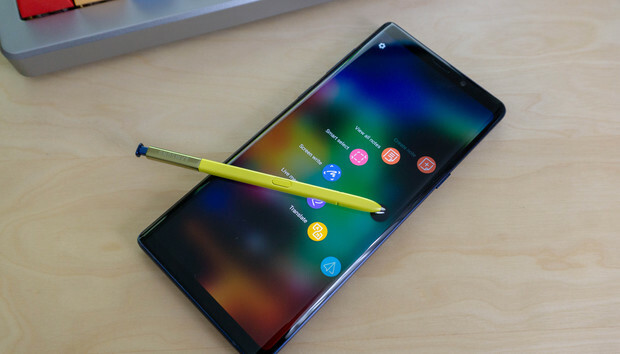 A Galaxy Note 9 might be one of the most expensive phones you can buy but if you factor in the money you're saving on a workstation, it's not nearly so dear. The future that Samsung is pitching here is one where instead of owning a phone AND a workstation, you just own the former. And, to the company's credit, some of the benefits of this one-device lifestyle are made manifest through the DeX. For one, the fact that I was keeping my phone in the DeX dock for most of the day meant that the Galaxy Note 9 never really came close to running out of battery. Aside from one day, where I wasn’t in the office all that much, it rarely dipped below 60% battery remaining. So if you’re the kind of person who finds the Note 9’s battery life lacking, that’s one real-world improvement that the DeX (indirectly) enables. In addition, having relying on the DeX really highlighted to me just how robust Samsung’s native Android apps are. Perhaps unsurprisingly, they run better than pretty much anything else when in DeX mode regardless of whether I ran them in full screen or as a windowed application. In a environment plagued by janky incompatibilities, Samsung’s web browser, calendar and emails apps were a an oasis of relative stability and productivity. There’s a new DeX Labs mode, which Samsung introduced earlier this year alongside the promise that it’d make more Android apps compatible. And taken at scale, that claim might well be true. However, on a more-everyday level, the DeX experience is still a bit of a crap-shoot when it comes to playing nice with *most* Android Apps. For example, Firefox (my usual go-to web browser) outright doesn’t run in DeX mode and most video streaming apps either don’t work or don’t support playback in anything but a small phone-sized window. If you feel like watching video content, Netflix works - but getting it to play full-screen is like pulling teeth. Speaking of web browsers, Chrome support in DeX is reasonably robust. Unfortunately, it'll automatically try to boot into an app where appropriate - which makes sense on mobile but predictably causes problems in DeX because those apps might not have the same level of friendliness to the Samsung faux-desktop interface. Still, for what it's worth, DeX Labs did make something of a difference here. With the new feature disabled, the majority of the apps I’d use would boot in in phone mode on the larger display. With DeX Labs toggled on, a handful of those apps booted into a more desktop-friendly format - usually just their tablet-mode counterparts. While it’s difficult not to concede the improvements to the status quo brought by DeX Lab are a step forward, it’s hard not to call the experience what it is: a mixed bag. Sure, the Samsung and Microsoft apps are well-optimized. Everything else? Less so. In this sense, little has changed for the DeX experience over the last twelve months. And when push came to shove, this reality proved to be a real snag to my productivity using the DeX. Attempts to highlight text would often be read as swipes, Gmail pop-ups quickly consumed any empty screen space and even the experience of alt-tabbing between different apps is a lot clunkier than it ought be - since you have to physically click to select the tab you want to jump to (for some arcane reason). Mouse and keyboard functionality works as you’d expect - but it's also stifled in a bunch of weird ways you might not anticipate. Some apps have been built around dragging as a primary interaction. However, very few support right clicking and even less support mouse scrolling. Same goes for keyboard shortcuts. Some apps support copy and paste. Others don’t. For obvious reasons, that inconsistency often bred frustration. Yes, you can totally hook a set of Bluetooth headphones up to the DeX and live that hands-free life. However, as someone who doesn’t necessarily always want to have wireless headphone occluding my hearing while I work, I generally left the Galaxy Note 9 set to loudspeaker when in the DeX dock. Whenever I’d get a call, my phone would ring. I’d have to physically unplug it from the DeX, wait a couple of seconds for the device to switch back to regular mode before I could actually answer the call. Working within a conventional office environment, it proved an incredibly awkward process. It’s probably telling that Samsung barely paid any lip service to the DeX during their recent Developers Conference. When it was introduced in 2017, the DeX was a curiosity bristling with potential. Nowadays, it seems like a dead-end. Samsung are pouring more and more research and development dollars into Bixby, 5G and foldable displays. DeX seems to have fallen by the wayside. And maybe that’s for the best. DeX is probably not the future of computing - it’s a neat capability for Samsung's devices to have but simply too niche and inconsistent for everyone else to meaningfully rely on. Samsung’s slimming down of the hardware involved - though technically impressive - has done little to change that. As launch, the Dex was a compromise for everyone involved - and that hasn't really changed over the last twelve months. In some ways, the DeX experience in 2018 is better than the DeX experience of 2017. But in others, it’s arguably worse. In my initial review of the DeX, I said that Samsung needed to put more hardware into the DeX - they’ve instead opted for less. If you’re the rare kind of user who can get away with doing their workflow using the DeX, I’m actually more impressed with you than I am Samsung. Honestly, if you've read all of the above and still think "Yeah, I could make that work", you should totally give the DeX a spin because it feels like most people won't have that same opportunity. Go for it. This isn’t to say that the DeX is a disaster - it’s not. To Samsung's credit, it’s a miracle the whole experience is as usable as it is. All the same, the software and hardware caveats involved mean that it’s probably going to remain a niche feature until it quietly fades into the backdrop. Hopefully, the lessons that Samsung have learned here don’t do the same. Because there are absolutely lessons to be learned here. In fact, Samsung’s recent announcement that crafty users will now be able to run Linux in DeX mode seems to suggest they’ve been doing exactly that. Android is a brilliant mobile operating system. But trying to bend Android’s mobile-first ecosystem out of shape to suit a small segment of desktop-minded users isn’t just an efficient and sustainable way forward - it’s futile for everyone involved. By contrast, realising that high-end devices like the Galaxy Note 9 (which Samsung do have greater control over) are actually powerful enough that it doesn’t need to offer a desktop-like experience via Android seems like a more fruitful avenue. It might sound sacrilegious but as more OEMs dabble with Snapdragon-powered Windows machines, the idea of dual-booting a version of Windows 10 on smartphone hardware is sounding less and less crazy by the day. Either way, the DeX itself seems doomed. The introduction of DeX Labs bought it some time but it’s doomed all the same. Samsung’s move to offer Linux support suggests they're keen to move onto whatever comes next than continue to extend the life of an experiment that's already reached a terminal phase. When it comes to technology and computing, everyone is fighting to define the future - and Samsung have failed that fight with the DeX. Whether today's failures will be worth it, and lay the foundation for tomorrow's successes, remains to be seen. Convergence is coming and the road to get there is going to probably going to be paved by failures like the Samsung DeX.